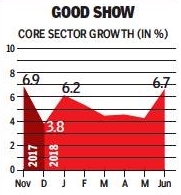 Growth in the country’s crucial core sector rose to a seven-month high in June on the back of a robust output in cement, coal and refinery segments, pointing to strong growth in industrial production data to be released later this month. Growth in the eight core sectors — spanning coal, crude oil, natural gas, refinery products, fertilizer, steel, cement and electricity — rose an annual 6.7% in June, faster than previous month’s upwardly revised 4.3% and higher than 1% expansion in the same period last year. Cumulative growth in the April-June period was 5.2% compared to 2.5% in the year earlier period. The core sector accounts for nearly 41% of the index of industrial production and any strong output augurs well for the overall industrial output. The cement sector rose an annual 13.2% in June, faster than the 13.2% recorded in the previous month. Coal production grew 11.5% in June, slower than previous month’s 12.2%, while refinery products expanded 12%, faster than previous month’s 4.9% expansion. Natural gas and crude oil were the laggards. Crude oil contracted 3.4% in June, while natural gas declined 2.7%.